There are many things you can make with yarn and the simplest crochet stitches – crocheted afghans, crocheted sweaters, crocheted scarves, crocheted toys – but did you ever think about making crocheted art? Yellow Trumpet by Gabriele Meyer. All the photos in this post are examples of hyperbolic surfaces. Overly simplified, a hyperbolic surface is one that is constantly curving – there are no flat or level planes in the entire piece. Hyperbolic Disk with Red Rim by Gabriele Meyer. 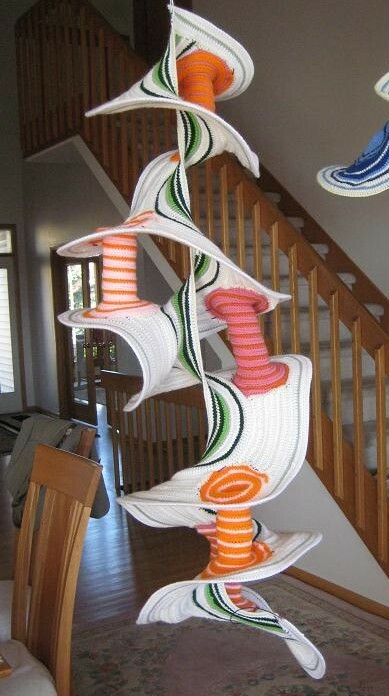 Some of these crocheted art pieces – like this one – appear to be made entirely with single crochet stitches. 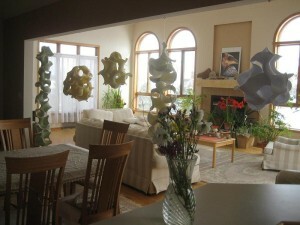 The shapes could be set with either a lot of starch or fishing line running through the edge – or a combination of both. 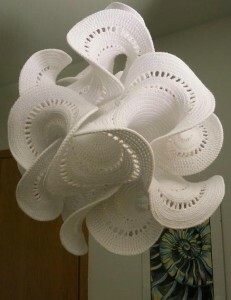 White Hyperbolic Surface by Gabriele Meyer. Others including double crochet stitches, such as this one. See the open stitches near the edges? Red Flame Sculpture by Gabriele Meyer. Not all hyperbolic surfaces have to be so twisty. Check out this simpler one. Blue Triangle Algae by Gabriele Meyer. I love the blues in this one! 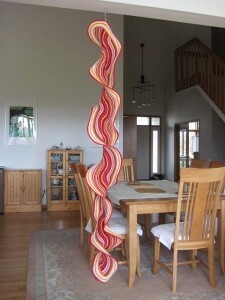 New Spiral by Gabriele Meyer. 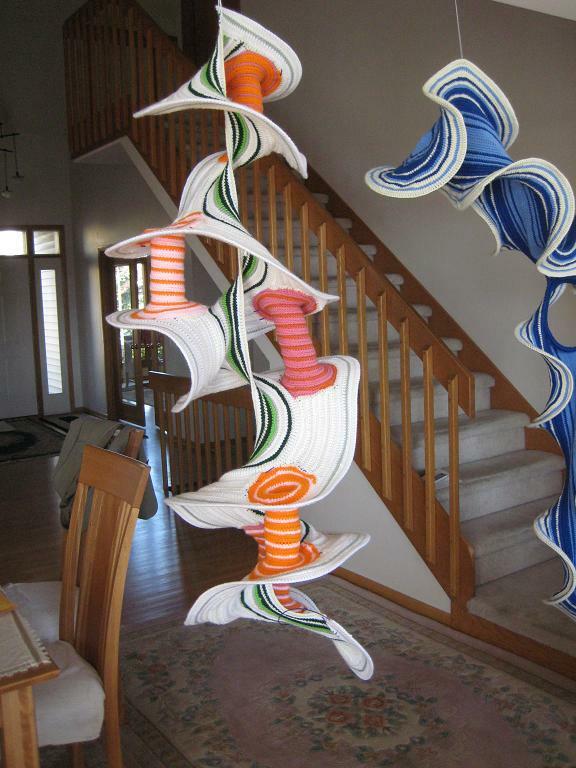 Check out the way each tier of the spiral is connected by the striped tubes. 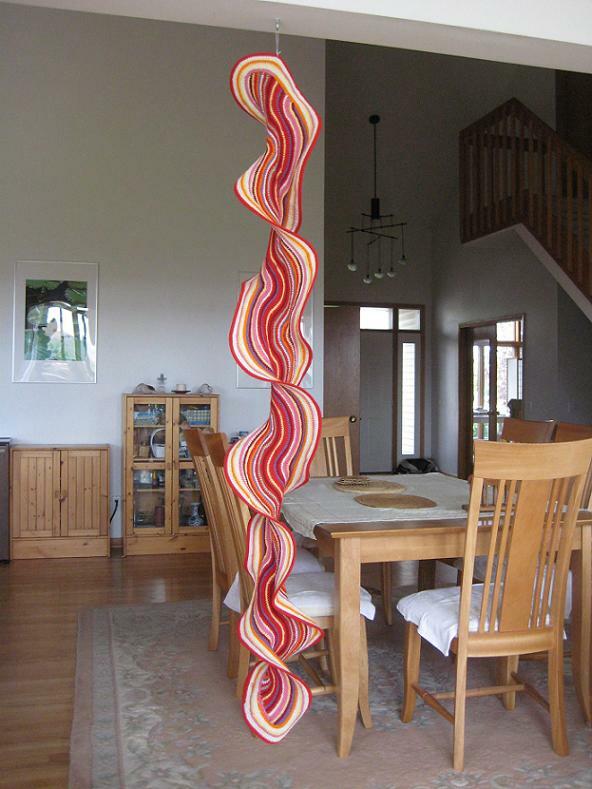 Tower of Yellow and Red Hyperbolic Disks by Gabriele Meyer. Hyperbolic surfaces can be combined to make beautiful sculptures. 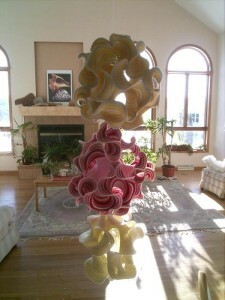 Four Air Sculptures by Gabriele Meyer. Here’s a photo of four similar pieces together. Notice how the shapes go together, even though the colors in each are different. Hyperbolic Surfaces by Gabriele Meyer. Many different shapes are possible with hyperbolic surfaces! Red Flower by Gabriele Meyer. This one even looks like a gorgeous flower! 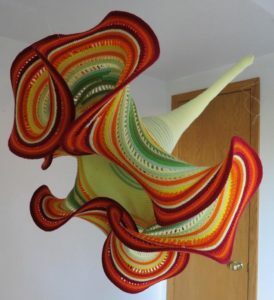 These are only some of the beautiful work that has been done with crocheted hyperbolic surfaces. You can find more great pictures here and here and here. 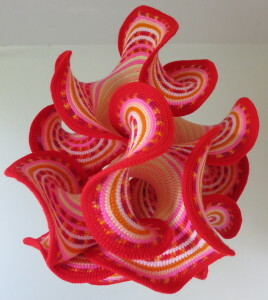 Hyperbolic crochet is often used in the making of Crochet Coral Reefs. Despite how complicated these pieces may look, they are relatively simple to make. 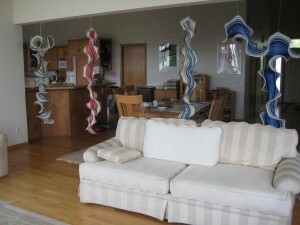 Crochet a chain of any length (I suggest you start small – maybe 10-20 chains.) You can choose to work in single, half double, or double crochets. Pick any number that’s less than the number of chains you have and crochet that many stitches then increase. Say I picked 3 and was doing single crochet – I would single crochet in the second chain from the hook, then single crochet in each of the next two stitches. In the next stitch I would work 2 single crochets, then repeat (single crochet in each of the next 3 stitches, 2 single crochets in the following stitch) across. Don’t worry if you aren’t able to finish the repeat at the end of the row. Then chain 1 and turn, repeating the pattern across. We are working on a video tutorial on hyperbolic crochet, so be sure to check back for that soon! Maggie loves Dreamz wooden crochet hooks for nearly every project. They’d work great for hyperbolic crochet! Premier Home Cotton Grande Yarn. Worsted weight yarn is a great choice for this project. Premier Home Cotton Yarn comes in solid and variegated colors, so there’s plenty of choices to mix and match. 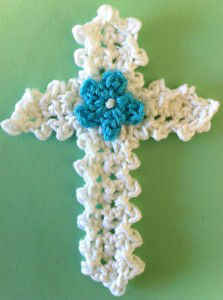 Lizbeth Size 3 Crochet Thread. For a more delicate look, you might want to consider a size 3 crochet thread, such as Lizbeth which comes in 45 solid colors and 45 variegated colors. re: Hyperbolic surfaces in crochet …. 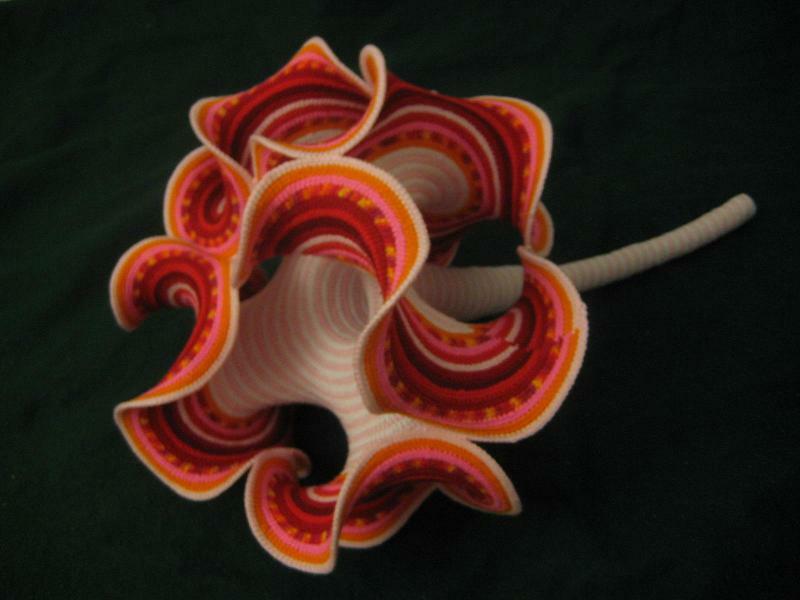 Do any instructions or patterns exist which result in one of the hyperbolic forms? I watched one of the first explanations on film of how these forms were first tried. They mimic not only sea shells, but also many delicate forms in our bodies and other parts of nature. At that time, only needlework was able to duplicate the hyperbolic forms. Please answer (by email) Thank you. Would love to learn how to do that!!! to learn more about how you made them. I love these, I would love to try and make a flower. is there instructions on how to make them. Georgous. 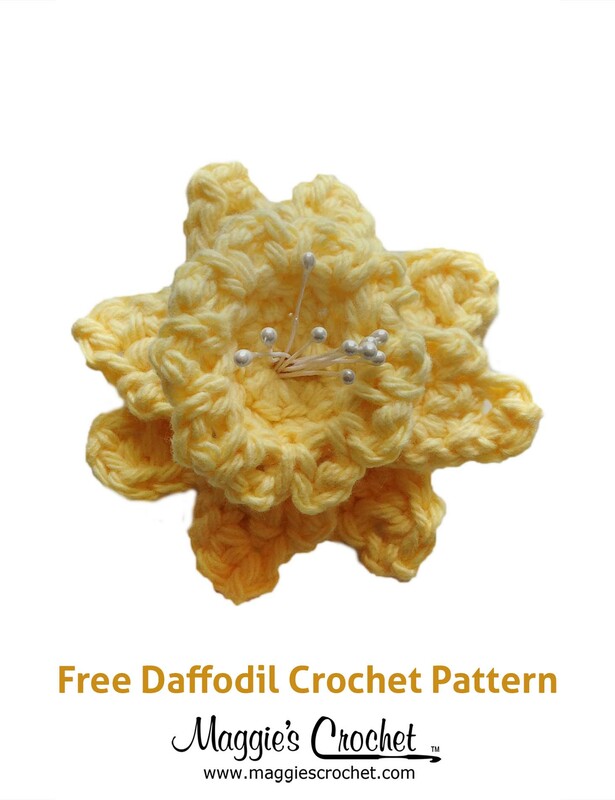 Where can I download photos of crochet about which I have questions? I posted 2 to your FB, but that got no direct reply. Where can I post them …. need to know what I did wrong! Hi Pat, you can send us a private message on FB and someone will get back to you. After scrolling through the last few posts we have on FB I didn’t see anything. If you questions about one of Maggie’s patterns you can email us at patternhelp@maggiescrochet.com. me gustaria un video tutorial de la flor. gracias !! hermosos los trabajos.